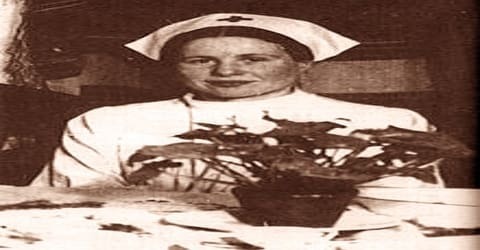 Irena Sendler – Polish social worker, humanitarian, and nurse. Polish social worker Irena Sendler was born on 15 February 1910 in Warsaw, to Dr. Stanisław Krzyżanowski, a physician, and his wife, Janina. She grew up in Otwock, a town about 15 miles (24 km) southeast of Warsaw, where there was a vibrant Jewish community. During World War II, she helped to rescue 2,500 Jewish children from the Warsaw Ghetto and placed them in convents or with non-Jewish families. Working as a nurse and a social worker, she was active in the ‘Polish Underground’ the Polish resistance movement in World War II in German-occupied Warsaw during the World War II. As a young woman, she was deeply influenced by her father who was a doctor and also one of the first Polish Socialists. She grew up watching her father tend to the poor patients and this instilled in her a desire to help the needy and the underprivileged in whatever ways she could. When the Germans invaded Warsaw in 1939 and started inflicting unspeakable tortures on the Jewish population, she made it her priority to help out the Jews by offering them food and shelter. She collaborated with some of her trusted allies and used her position to obtain thousands of false documents to help the Jewish families. In the 1930s, Sendler conducted her social work as one of the activists connected to the Free Polish University. 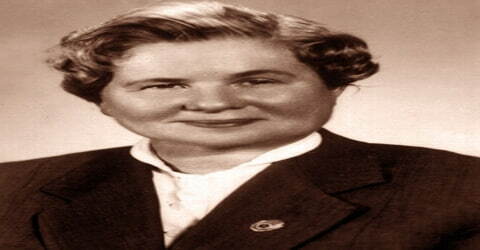 From 1935 to October 1943, she worked for the Department of Social Welfare and Public Health of the City of Warsaw. 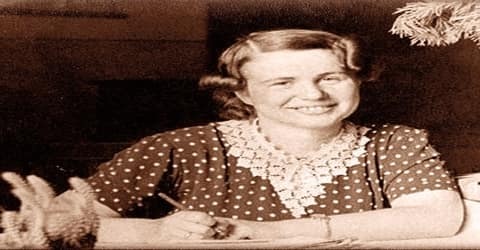 She also pursued informally and during the war conspiratorial activities, such as rescuing Jews, primarily as part of the network of workers and volunteers from that department, mostly women. Sendler participated, with dozens of others, in smuggling Jewish children out of the Warsaw Ghetto and then provided them with false identity documents and shelter with willing Polish families or in orphanages and other care facilities, including Catholic nun convents, saving those children from the Holocaust. When the Nazis invaded in 1939, Irena was a social worker and so had access to the Warsaw Ghetto, where hundreds of thousands of Jews were imprisoned. As a member of Żegota (aka Konrad Żegota Committee, the Council to Aid Jews), she helped rescue 2,500 Jewish children from the ghetto. The German occupiers suspected Sendler’s involvement in the Polish Underground and in October 1943 she was arrested by the Gestapo, but she managed to hide the list of the names and locations of the rescued Jewish children, preventing this information from falling into the hands of the Gestapo. Withstanding torture and imprisonment, Sendler never revealed anything about her work or the location of the saved children. She was sentenced to death but narrowly escaped on the day of her scheduled execution, after Żegota bribed German officials to obtain her release. In communist Poland, Sendler continued her social activism but also pursued a government career. Among the many decorations Sendler received were the Gold Cross of Merit granted her in 1946 for the saving of Jews and the Order of the White Eagle, Poland’s highest honor, awarded late in Sendler’s life for her wartime humanitarian efforts. 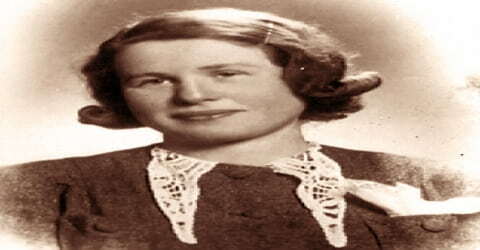 Irena Sendler, (Irena Krzyzanowska), also referred to as Irena Sendlerowa in Poland, nom de guerre “Jolanta”, was born on 15 February 1910 in Otwock, near Warsaw, to Stanisław Krzyżanowski and his wife Janina. She was the only child of her parents. Her father, a humanitarian who treated the very poor, including Jews, free of charge, died in February 1917 from typhus contracted from his patients. After his death, the Jewish community offered financial help for the widow and her daughter, though Janina Krzyżanowska declined their assistance. From 1927, Sendler studied law for two years and then Polish literature at the University of Warsaw, interrupting her studies for several years from 1932 to 1937. By the outbreak of World War II, she submitted her magister degree thesis but had not taken the final exams. Sendler joined the Union of Polish Democratic Youth (Związek Polskiej Młodzieży Demokratycznej) in 1928; during the war, she became a member of the Polish Socialist Party (PPS). She was repeatedly refused employment in the Warsaw school system because of negative recommendations issued by the university, which ascribed radically leftist views to her. Sendler was a courageous girl and openly protested against the ghetto-bench system that existed at some prewar Polish universities. Due to this, she was suspended from the University of Warsaw for three years. She became associated with social and educational units of the Free Polish University (Wolna Wszechnica Polska), where she met and was influenced by activists from the illegal Communist Party of Poland. At Wszechnica Sendler belonged to a group of social workers led by Professor Helena Radlińska; a dozen or more women from that circle would later engage in rescuing Jews. From her social work on-site interviews, Sendler recalled many cases of extreme poverty that she encountered among the Jewish population of Warsaw. Irena Sendler first got married Mieczysław Sendler in 1931. He was mobilized for war, captured as a soldier in September 1939 and remained in a German prisoner of war camp until 1945; they divorced in 1947. Sendler then married Stefan Zgrzembski (born Adam Celnikier), a Jewish friend and wartime companion, by whom she had three children, Janina, Andrzej (who died in infancy), and Adam (who died of heart failure in 1999). In 1957 Zgrzembski left the family; he died in 1961 and Irena remarried her first husband, Mieczysław Sendler. Ten years later they divorced again. During the late 1930s, Irena Sendler moved to Warsaw and started working for the municipal Social Welfare departments. Soon after the German invasion, on 1 November 1939, the German occupation authorities ordered Jews removed from the staff of the municipal Social Welfare Department where Sendler worked and barred the department from providing any assistance to Warsaw’s Jewish citizens. Sendler with her colleagues and activists from the department’s PPS cell became involved in helping the wounded and sick Polish soldiers. On Sendler’s initiative, the cell began generating false medical documents, needed by the soldiers and poor families to obtain aid. Her PPS comrades unaware, Sendler extended such assistance also to her Jewish charges, who was now officially served only by the Jewish community institutions. With Jadwiga Piotrowska, Jadwiga Sałek-Deneko and Irena Schultz, Sendler also created other false references and pursued ingenious schemes in order to help Jewish families and children excluded from their department’s social welfare protection. Irena Sendler was working as a Senior Administrator in the Warsaw Social Welfare Department at that time. The department operated canteens all over the city and provided meals and other necessities to the orphans, elderly, and the poor. She realized the pathetic situation of the Jews under the Nazis and helped the Jews by registering them under fictitious Christian names and reported the Jewish families as being afflicted with highly infectious diseases in order to prevent inspections. Sendler was taking a huge risk by helping the Jews as giving any kind of assistance to Jews in German-occupied Poland was punishable by death. Yet she courageously continued her services to the Jews. Trained as a social worker, Sendler became (1942) a member of Zegota (Council to Aid the Jews), the Polish underground organization established to help save Jews from the Nazi occupiers. She used such creative means as coffins and ambulances to remove children to safety, supplied them with fake birth certificates with Aryan names, placed them in sympathetic Christian orphanages and convents, and buried jars containing lists of their real names for future reference. Sendler joined the Polish Socialists, a left-wing branch of the Polish Socialist Party (PPS). The Polish Socialists evolved into the Polish Socialist Workers’ Party (RPPS), which cooperated with the communist Polish Workers’ Party (PPR). Sendler was known there by her conspiratorial pseudonym Klara and among her duties were searching for places to stay, issuing fake documents and being a liaison, guiding activists to clandestine meetings. In the RPPS there were Poles she knew, involved in saving Jews, as well as Jews that she had helped. Sendler participated in the secret life of the ghetto. She described a commemoration event there, on the anniversary of the October Revolution but in the spirit of the Polish leftist tradition; it included artistic performances by children. While in the ghetto, she wore a Star of David as a sign of solidarity with the Jewish people. Żegota (the Council to Aid Jews) began by saving Jewish orphans. It was an underground organization that originated on 27 September 1942 as the Provisional Committee to Aid Jews, led by Zofia Kossak-Szczucka, a resistance fighter, and writer. They had several ways of smuggling them out of the ghetto: Some were carried out in caskets or potato sacks; others left in ambulances or snuck out through underground tunnels. Still, others entered the Jewish side of a Catholic church that straddled the ghetto boundary and left on the other side with new identities. Sendler then helped place the children at convents or with non-Jewish families. Żegota, established on 4 December 1942, was a new form of the committee, expanded by the participation of Jewish parties and chaired by Julian Grobelny. It was financed by the founder of the Provisional Committee, the Government Delegation for Poland, a Polish Underground State institution representing the Polish government-in-exile. Working for Żegota from January 1943, Sendler functioned as a coordinator of the Welfare Department network. They distributed money grants that became available from Żegota. Regular payments, however insufficient for the needs, enhanced their ability to assist the hiding Jews. In August 1943, Żegota set up its children’s section, directed by Aleksandra Dargiel, a manager in the Central Welfare Council (RGO). Dargiel, overwhelmed by her RGO duties, resigned in September and proposed Sendler to be her replacement. Sendler, then known by her nom de guerre Jolanta, took over the section from October 1943. Permanently, Jewish children were placed by Sendler’s network with Polish families (25%), in Warsaw orphanage of the Franciscan Sisters of the Family of Mary led by Mother Provincial Matylda Getter, Roman Catholic convents such as the Sister Servants of the Blessed Virgin Mary in Turkowice (sisters Aniela Polechajłło and Antonina Manaszczuk) or the Felician Sisters, in Boduen Home charity facilities for children, and other orphanages (75%). A nun convent offered the best opportunity for a Jewish child to survive and be taken care of. To accomplish the transfers and placement of children, Sendler worked closely with other volunteers. The children were often given Christian names and taught Christian prayers in case they were tested. Sendler wanted to preserve the children’s Jewish identities, so she kept careful documentation listing their Christian names, given names, and current locations. On October 20, 1943, the Nazis arrested Sendler and sent her to Pawiak Prison. There they tortured her, trying to get her to reveal the names of her associates. She refused and was sentenced to death. However, Żegota members bribed the prison guards, and Sendler was released in February 1944. 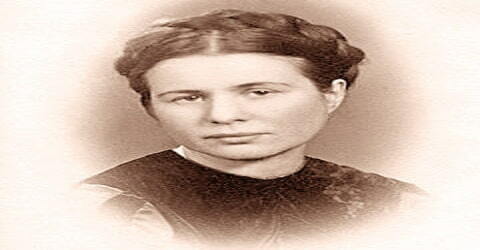 Sendler continued her work until the war ended, by which time she and her colleagues had rescued some 2,500 children. It has been estimated that Sendler personally saved about 400. According to American historian Debórah Dwork, Sendler was the inspiration and the prime mover for the whole network that saved Jewish children. She and her co-workers buried lists of the hidden children in jars in order to keep track of their original and new identities. The aim was to return the children to their original families, if still alive after the war. Sendler managed to escape death at the last minute due to the intervention of Zegota members. She then acquired a false identity and continued her work with the Zegota, working as a nurse until the Germans left Warsaw. During her later years, she worked for the Ministries of Education and Health and helped to organize a number of orphanages and children, family, and elderly care centers. In the Polish People’s Republic, Sendler received at least six decorations, including the Gold Cross of Merit (Złoty Krzyż Zasługi) for the wartime saving of Jews in 1946, another Gold Cross of Merit in 1956, and the Knight’s Cross of the Order of Polonia Restituta in 1963. Materials dealing with her activities during the war were published, but Sendler became a well-known public personality only after being “rediscovered” by the group from an American high school in 2000 (at the age of ninety). From 1962, Sendler worked as deputy director in several Warsaw trade medical schools. At every stage of her career, she worked long hours and was intensely involved in various social work programs, such as helping teenage prostitutes in the ruins of post-war Warsaw recover and return to society, organizing a number of orphanages and care centers for children, families and the elderly, or a center for prostitutes in Henryków. She was known for her effectiveness and displayed a sharp edge when confronted with obstruction or indifference. Sendler was recognized by Yad Vashem as one of the Polish Righteous Among the Nations and received her award at the embassy of Israel in Warsaw in 1965, together with Irena Schultz. In 1983 she traveled to Israel, invited by Yad Vashem Institute for the tree-planting ceremony. In 1980, Sendler joined the Solidarity movement. She lived in Warsaw for the remainder of her life. Irena Sendler was recognized by Yad Vashem as one of the Polish Righteous among the Nations in 1965, and a tree was planted in her honor at the entrance to the Avenue of the Righteous. In 1991, Sendler was made an honorary citizen of Israel. On 12 June 1996, she was awarded the Commander’s Cross of the Order of Polonia Restituta. She received a higher version of this award, the Commander’s Cross with Star, on 7 November 2001. She was honored with the Order of the White Eagle, Poland’s highest civilian decoration, in 2003. In 2008, Sendler was nominated for (but did not win) a Nobel Peace Prize. The story of her life was also captured in a 2009 TV movie The Courageous Heart of Irena Sendler, which starred Anna Paquin in the title role. Sendler was posthumously granted two awards in 2009: the Humanitarian of the Year award from The Sister Rose Thering Endowment, and the Audrey Hepburn Humanitarian Award. Irena Sendler lived a long life and spent her last years in Warsaw. 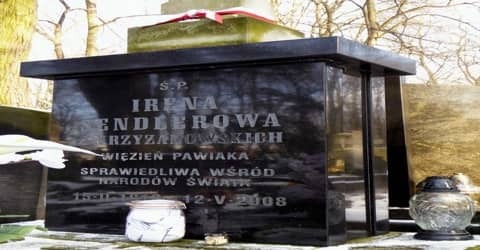 She died on 12 May 2008, aged 98, and is buried in Warsaw’s Powązki Cemetery. 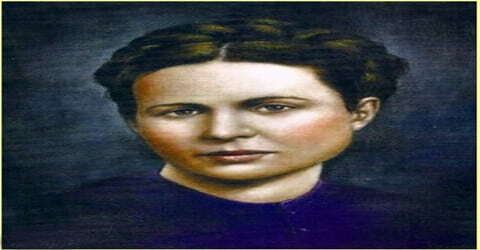 Sendler is best remembered for the pivotal role she played in saving the lives of approximately 2,500 Jewish children during the Holocaust in which most of the parents ultimately perished. She smuggled them out of the Warsaw Ghetto and helped in finding them homes with non-Jewish families, an act for which she later received widespread recognition. Works written about her include a one-act play entitled Life in a Jar (1999), written by four Kansas schoolgirls, and the biography Mother of the Children of the Holocaust: The Story of Irena Sendler (2004). In 2007 Sendler was nominated for the Nobel Prize for Peace. 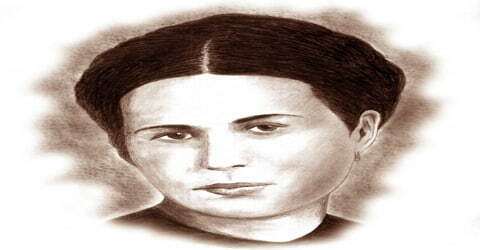 Sendler never told her children of the Jewish origin of their father; Janina Zgrzembska found out as an adult. It wouldn’t make any difference, she said: the way they were brought up, race or origin didn’t matter. On 14 March 2007, Sendler was honored by the Senate of Poland, and a year later, on 30 July, by the United States Congress. On 11 April 2007, she received the Order of the Smile; at that time, she was the oldest recipient of the award. In 2007 she became an honorary citizen of the cities of Warsaw and Tarczyn.